Just a regular recycling bin. Surely not overwhelming! The recycling bin looks so innocent just sitting there waiting for someone to empty the appropriate items inside. Such an easy task. Keep recyclable items in a designated trash can inside the house or maybe in the garage. Relocate all of the contents to the bin before the truck arrival once a week . Pull the bin to the street. Sometimes the pulling might require the use of a few muscles here and there. So easy. Such the right thing to do. The inside the house or garage recycling can. Such the right thing to do until last Tuesday. I imagine that I simply didn’t have the acceptable technique for putting the contents of the little container into the big container. I mean…really now…it is not such a totally overwhelming task! I have emptied the little can into the big can hundreds of times. My husband has emptied the little can hundred of times. So have our neighbors, our children when they were growing up, all of our neighbor’s children. Not even one mishap. Until the really aggressive behavior of the recycling bin last Tuesday. And…it just had to happen to me. Or was I the aggressive one? Two liter bottles surely are not heavy! NOTHING TO WARRANT THIS RECYCLING BIN BEHAVIOR…I DO NOT CHOOSE TO REMEMBER IT IF I INDEED DID SOMETHING WRONG. And then the above pictured problem happened. I walked up to the bin and opened the lid so it would stay back. As I was beginning to empty the small can into the recycling bin, I realized that it was way heavier than I thought. I struggled to turn the can over to empty out. I almost pushed the entire large bin over and dropped the whole small can into the bin. In this fairly ridiculous process, I slammed my left wrist into the sharp plastic edges of the inside of the bin. They certainly did not look sharp. They were overwhelmingly sharp. I would not dare show you what my hand looked like at first or how my wrist started swelling so much that I could not remove my watch. So glad that the watch was not high priced at all. Emphasis on WAS since if it is 3:00…my watch now says 5:00 and will not change. My hand will also not be working right for a while. There was a place much worse than a scratch…like you would not believe. Let’s not even talk about the large bruise that immediately appeared on the top of my hand. I spent three hours going to the doctor and having my hand patched up. Not fun. Especially after I had been so nice to that recycling bin. However…I did take the bin to the street. I did not want to take any chances on further injuries! oh no! hope you mend well and swiftly. I love the painting. Hello! Thank you for your note…my hand is doing better. I still have the bandage and it hurts some, but I will be fine! 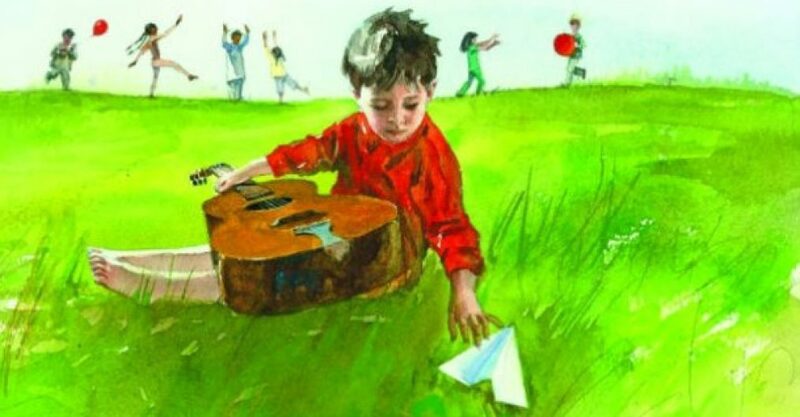 The painting is from the beautiful children’s book “Blowin’ in the Wind”…featuring the words from the song and a CD of the original recording by Bob Dylan. I wrote a blog about it a few months ago! I looked back and the post about the “Blowin’ in the Winds book was posted on December 3, 2016. Title…Super Engaging Book #10! Thank you, Faye! Chicken soup does make everything better! I was planning on making potato soup after I finished with the recycling chore! Needless to say…no homemade soup yet! My hand feels better, but it will be sore for a while. Honestly, the whole incident was scary because it happened so fast! I have never used Lavender Essential Oil…I will have figure out where to get it! Anyway…I am just a mess about to happen at any time!! And…typing with one hand is not that fun!!! They take no prisoners Pat. Have a care. Wear protective gloving.